The Westchester Jewish Center Early Childhood Center (ECC) is a warm and nurturing environment that encourages and supports children’s cognitive, social, emotional and physical growth. The ECC is a progressive early childhood school where children are active learners, exploring and experimenting in a developmentally-appropriate manner. The ECC takes inspiration from a range of child-centered approaches to early childhood education with an emphasis on play-based and experiential learning. Our dedicated teachers work to stimulate and follow the children’s natural sense of wonder and curiosity as they explore new ideas within the classroom, on the playground, and throughout our community. Classes are structured to provide ample and varied opportunities for exploration and discovery both indoors and outdoors. All of our classrooms contain multiple learning centers including art stations, sensory tables, reading areas, and block corners, and teachers rotate stations in and out of the classrooms based on the interest and needs of the children. Children play and learn daily on our two playgrounds which, in addition to play structures and riding toys, also are home to our STEAM (Science, Technology, Engineering, Art & Math) center, where children can use engineering and observation materials, a mud kitchen for making and “baking” mud pies, a musical fence, and an outdoor classroom. On days with inclement weather, the learning continues in our gym which features climbing structures and riding toys along with oversized foam blocks for building life-sized creations. We view children as capable and competent and respect their individual needs and interests. A small teacher to student ratio assures that every child gets the individual attention he or she deserves in a safe and secure environment. We are committed to observing and identifying challenges that children may have in the areas of social-emotional, cognitive, fine/gross motor, sensory, speech and language development, and we help parents navigate the process to evaluate and obtain services when necessary. Children receive a solid Jewish foundation centered around the celebration of holidays and values such as tzedakah (charity) and tikkun olam (repairing the world). From having snack in the sukkah, to counting and packaging donated presents for Hanukkah, to marching in the Purim parade, Jewish holidays provide opportunities for children to learn outside of their daily classroom routine. Children also welcome Shabbat in their class every week and gather once a month with other classes for a larger community Shabbat celebration. We are proud to be a Project SEED school. 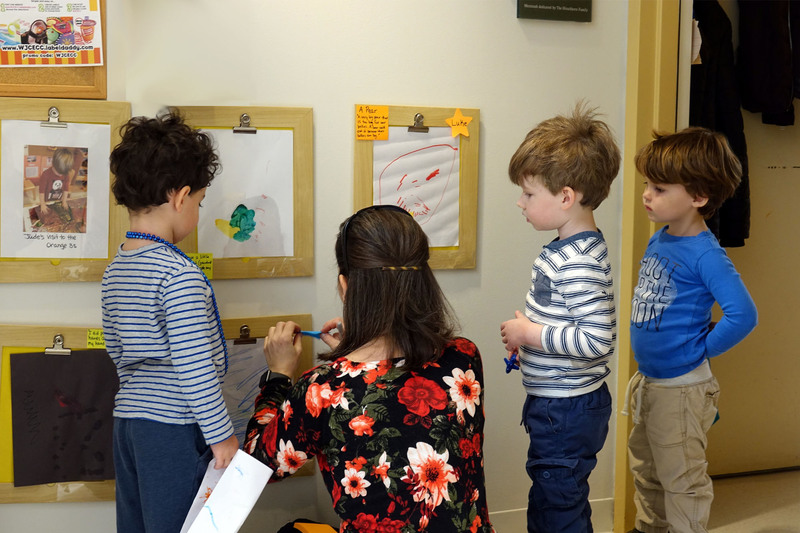 A collaboration between Westchester Jewish Community Services and the Jewish Education Project, Project SEED (Supporting Early Emotional Development) is designed to help early childhood educators support young children’s emotional development. SEED early childhood consultants are licensed social workers. They facilitate staff development training and work with teachers to build experience in our classroom environments. Through Project SEED, early childhood consultants become integral to the school community and support the directors, teachers, and parents in building stronger learning environments for children. Call us at (914) 698-2767 to schedule a tour and to attain more information. The philosophy of our Early Childhood Program is that the young child can develop a strong self-image through the use of positive reinforcement in a curriculum that enhances cognitive, physical, social, listening and language skills as well as moral growth. for their individuality, their extraordinary wealth of inborn abilities and potential, their strength and creativity. Children are active participants in the development of their identities, autonomy and creative intelligence. for their vision, their delight in children, their skill, dedication, knowledge and commitment to families. for their bonds and traditions, their commitment to career, home and community, and their visions for their children’s education. for the spirit of its teachings, values, traditions, culture and heritage. We encourage families to embrace Judaism at their own comfort level. Parent and teacher partnerships are fundamental to the foundation of our school community. This reciprocal relationship is built on mutual respect, cooperation, and shared responsibility. Our collaboration enables an effective communication network that enriches the growth, care and development of each child.